Is it white and gold? Or blue and black? That’s the question that had everyone searching, tweeting and generally freaking out Thursday after a Tumblr user posted a photo of a dress that seemed to appear different colors to different people. Debate over the true color of the dress raged for hours, while others tried to solve the mystery of its divisiveness. 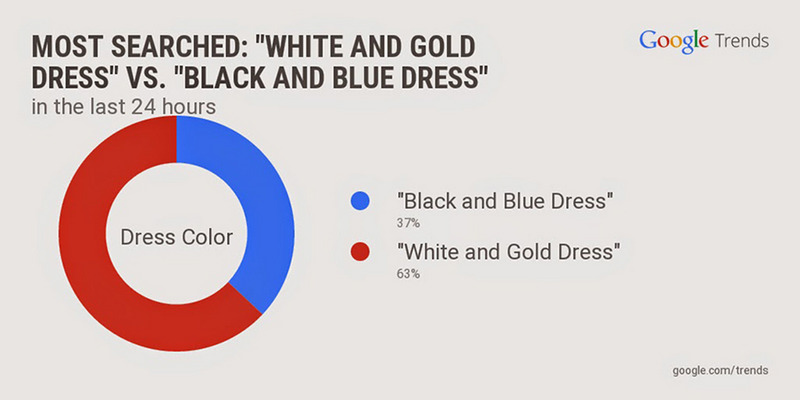 All we know is, there were more than two million searches for [white and gold dress] yesterday—more than for [blue and black dress]—proving once and for all that it’s white and gold… right? Before #thedress, though, there were the llamas. In Phoenix, Ariz., yesterday, two llamas got loose from their handlers and took off on a trot through neighborhood streets, yards and sidewalks. Searchers were captivated by the “llama drama,” which ended when police (l)lassoed the animals after a low-speed chase. 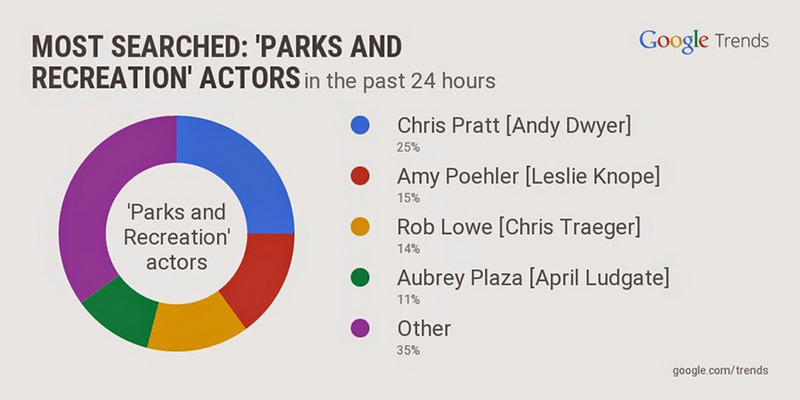 Armed with waffles, Lagavulin and a lot of tissues, we said farewell to NBC’s Parks and Recreation on Tuesday after a seven-year run. Searchers turned to the web to revisit favorite characters, quotes and episodes from the show that brought us “Treat Yo’ Self” and the Cones of Dunshire, while (wackily) celebrating the value of hard work, friendship and public service. Moving from the small-town politics of Pawnee to the big-time in D.C., this week President Obama issued his third-ever Presidential veto, rejecting a bill that would have approved the Keystone XL Pipeline project. People turned to the web to learn more about Presidential veto power throughout history and the pipeline itself. What would Leslie and Ron make of all this, we wonder? Woo-oo! 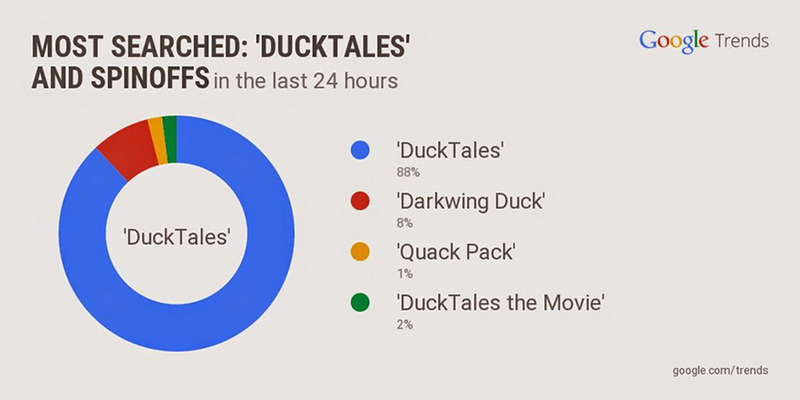 Nineties kids are rejoicing following news that the Disney cartoon DuckTales is getting a reboot. Searches for the show spiked 8x the day after the announcement. Sounds like a lot of you are ready for some tales of derring-do in 2017. And Madonna had a bit of a shaky week, after she fell backwards down a flight of stairs during her first performance at the Brit Awards in 20 years. But the Queen of Pop recovered quickly to finish her song “Living for Love.” She’s still an icon for a reason. This will be illuminating: if you have an Android device running Lollipop, you can flip the on/off switch on your phone’s flashlight just by saying “Ok Google, turn on my flashlight.” You can do the same trick to turn on or off WiFi or Bluetooth.